I am co-organizing the workshop Principles of Multi-Robot Systems at the 2015 RSS, Robotics Science and Systems conference in July 16th, Rome, Italy. You can visit the website http://mrs-rss2015.sciencesconf.org/ for more information on the list of speakers and the call for contribution. Abstract: The objective of this workshop is to give in-depth overviews of several areas of interest related to the field of multi-robot systems. In particular, we aim at providing a set of methodologies that can define the common background for researchers involved in the several areas that constitute the multi-robot systems community. While many workshops are narrowly focused on highly specialized topics, the intent of this workshop is to provide insight on a broad range of topics within multi-robot systems so that ideas and approaches can be shared across the varied subfields. 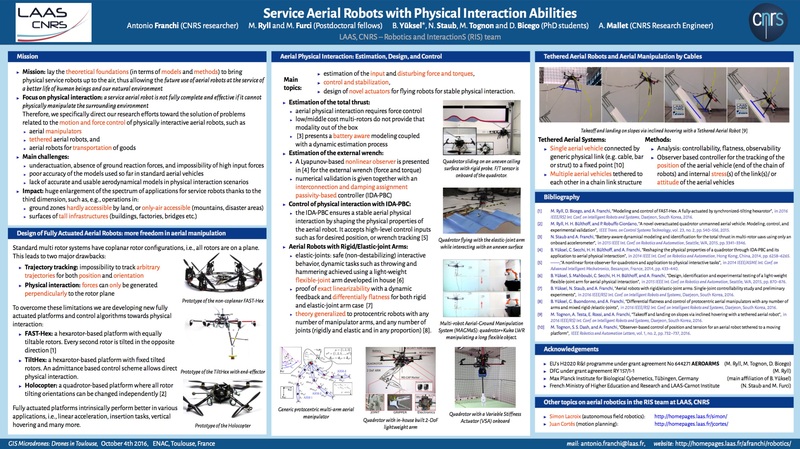 Researchers interested in multi-robot systems represent an inherently diverse community since several competences are needed in this field, ranging from control systems to mechanical design, estimation, perception, planning, and interaction, just to list a few. This causes, in general, a lack of a common background among multi-robot systems researchers, that represents an obstacle for dialogue and interchange, subsequently slowing down the development of the overall field. The main objective of this workshop is then in contributing to the definition of this common background. For this purpose, the workshop will be organized as a set of 30-minutes talks, each talk will represent a seminar that will aim at providing a comprehensive overview of a specific topic. The intended audience is constituted of researchers that work (or are starting to work) in the field of multi- robot systems, and that are not necessarily expert in the topics that will be touched by each talk. We invite contributions, to be presented during the Poster Sessions. Authors are required to submit Extended Abstracts (1-2 pages) in PDF format, using this link. Contributions in any area related to multi-robot systems are welcome.